Creativity is the mother of Abundance. When we take the time to make something with care, love, and enthusiasm, we get the ball rolling for more awesome things to start flowing in. Here's an exceptionally simple recipe for a safe bathroom tile mold killer. Less mold, more awesomeness! A bathroom like this could be heavenly or hellish! Pour in hydrogen peroxide (H2O2) to nearly fill the rest of the bottle. H2O2 is anti-fungal and it works because mold is a kind of fungus. As a bonus, it will bleach/fade the stain left by mold. You use ordinary 3% H2O2 or try Seventh Generation Non-Chlorine Bleach. Food Grade H2O2 (35%) is a stronger, and therefor more effective, concentration but it requires visiting the health food store or wandering the world wide web. Optional: If you have pleasant smelling anti-fungal essential oils on hand, add a total of 10 drops to the mix. Lavender, lime, cedar, and eucalyptus oil are all great fungi-fighting choices. Use a blend or stick to one type. Spray surface with solution. Let it work its magic for 10 minutes while you eat a delicious vegan doughnut, check Facebook news feed, or have a quickie. 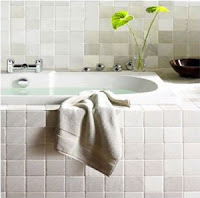 Remove visible mold by scrubbing the area with the mildly abrasive side of a white-- not the harder green kind-- nylon sponge (test rub in an inconspicuous spot if there are any concerns about scratching the tiles), a loofah sponge, a tile brush, or a toothbrush. Focus most of your energy on in-between the tiles and the area where to tiles meet the edge of the tub. Rinse a sponge or cloth with hot water and wipe down the area. Remove all water from the area. First use a squeegee. Then wipe it with a towel to make sure it's really dry. I'm being so crazy about this because water encourages the growth of mold. Take a hot bath with a few drops of essential oil thrown in; you deserve it! You can use this solution in moldy areas outside the bathroom. Avoid getting the solution on area rugs, your clothing, or anything else that you do not want bleached. Dry and clean the sponge you used to remove the mold by nuking it on high for 1.5 to 2 minutes. If you have solution leftover, store it in a dark bottle in a dark place, otherwise the H2O2 will convert to useless water. You could cover a clear bottle with masking tape to make it opaque. Keep the door or window cracked during showers or baths, then completely open after, to prevent the growth of more mold. A dehumidifier might be necessary if you have a bathroom that seems to keep growing mold despite your best efforts to remove and inhibit it. Full size fitted bed sheet blues buster! Create Abundance at Home #23: It's Business Time! Create Abundance at Home #21: Adopt-a-Turkey! Create Abundance at Home #19: Exercise! Create Abundance at Home #16: Vegan Book Swap! Create Abundance at Home #15: Donate a coat! Create Abunance at Home #14: Keep Promises. Create Abundance at Home #13: Get out of the box! Create Abundance at Home #12: Self High Five! Create Abundance at Home #11: Ask for Help! Create Abundance at Home #10: Create a Keepsake! Create Abundance at Home #8: Breathe. Create Abundance at Home #7: Rock out! Create Abundance at Home #6: Have fun! Create Abundance at Home #4: Co-own! Create Abundance at Home #3: Junk Drawer Detox! Create Abundance at Home #2: Picture it! Create Abundance at Home #1: Appreciation!